Although thousands upon thousands of electrical components make up many BeagleBone projects, a few could be called essential because of the frequency at which they’re employed in circuits. They’re also good candidates for playing around with on the BeagleBone and learning how to properly use the board. Resistors: Resistors are extremely cheap, and you can buy lots of them at a time. Buying an assorted pack of plenty of resistor values is definitely the best idea. LEDs: Get a few of them, in various colors! RGB LEDs: These LEDs differ slightly from the previous ones due to the fact that their colors can vary. Pushbuttons: Pushbuttons are the best way to add controllability to your projects. You use them for when you want stuff to happen only when you press the button. Switches: Similarly to pushbuttons, switches are used to control a circuit’s behavior. Unlike pushbuttons, the switch stays in the same position until you toggle it again, whereas you have to keep pressing a pushbutton to engage it. Buzzers: Buzzers are very simple electronic devices that output sound when a voltage is applied to them. 9V battery adapter: For projects where you need to use a 9V battery, you require an adapter to connect the battery’s poles to a breadboard. Variable resistors (potentiometers): Get at least a 2K and a 10K potentiometer. 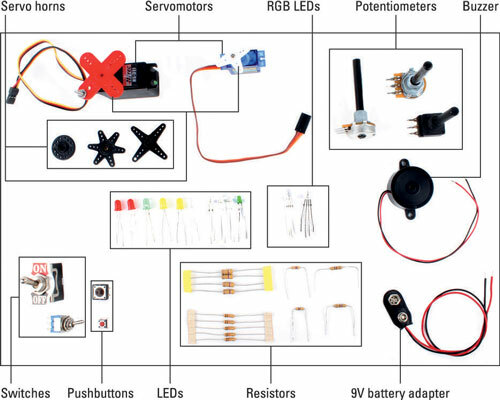 Servomotor: Servomotors are usually tiny, slow-rotating motors that require a small amount of current to do their jobs, which makes them ideal to use with development boards such as the BeagleBone. Servo horn: Servo horns are small plastic components that are attached to your servomotor to suit different needs. Although you can use other kinds of motors with the BeagleBone, such as DC motors, they require external circuitry to amplify the low current that’s drawn from the BeagleBone’s pins. Most online electronics shops feature starter kits, which may be the easiest way to get launched into circuit design. Purchasing a starter kit usually ensures that you get a good deal, because buying all the components separately is more expensive.